We found this article on QC Career School’s blog and thought it would be a great one to share! When it comes to using social media for business, there are many things you should consider and be aware of. Your social media sites are a way for people to find you, engage with you, and to get to know your brand. Projecting a professional image is key, especially in a public forum where everyone can see exactly what you’re posting and how you respond to certain situations. Good or bad, this can drastically affect whether or not a potential client who follows you wants to give you their business. 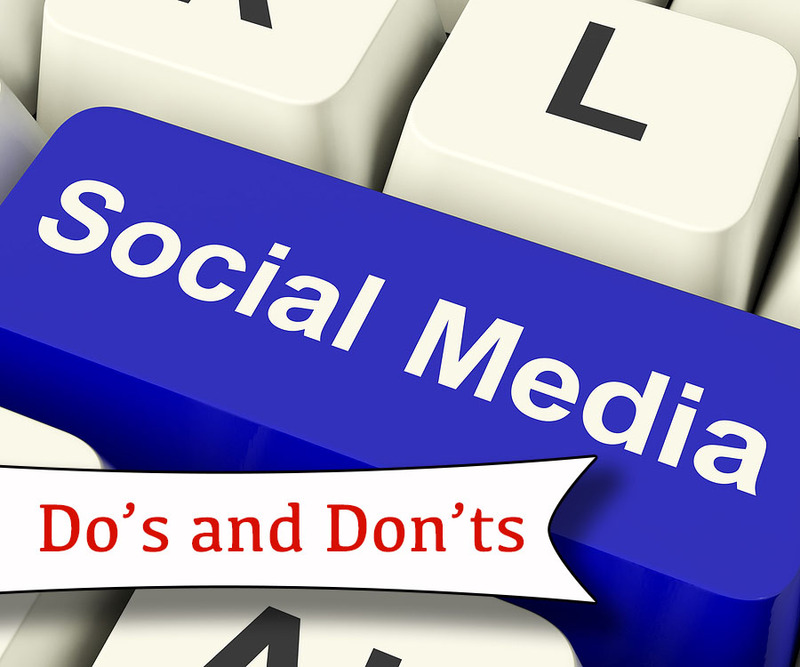 Check out our do’s and don’ts when using social media for business in order to get the most out of it and avoid getting into any hot water. If you’re using social media for your business, be aware that clients and potential clients will use this as a means to communicate with you. This may be a post to your Facebook timeline, a comment on your Instagram photo, or a reply to a tweet on Twitter. Whatever the case, you should reply in a timely manner and be polite! Your social media business page is visible to the public, and if you’ve written a poor response to someone, everyone can see it. By replying quickly and professionally, you’re giving your followers a taste of the quality of service you provide. For Twitter in particular, because you are limited to only 140 characters, you probably won’t be able to follow all of these tips. Provide as much information as you can, use shortened links, and don’t be afraid to respond in multiple tweets if you need to. When browsing the social media world and engaging with other users through your business account, try your very best not to get into heated debates. Everyone has an opinion, and you should be confident in yours but understanding to those that differ. If someone tries to spark a debate with you, remember to respond with dignity and grace (should you decide to respond at all). I like to follow the motto of “kill them with kindness.” Even if it’s not on your own business page, your followers are sometimes notified of your activity and you don’t want them to see you in a pointless debate with someone you don’t even know. This reflects poorly on your business and followers will be hesitant to work with you. On the other hand, you might have someone causing trouble on your own social media page. Before you do anything, like “hiding” their post/comment, blocking the user all together, or responding back, you should investigate. Are they simply being an “internet troll” (someone who starts fights over the internet for their own personal amusement), are they just being plain rude or offensive, or are their negative posts justified? After you’ve investigated, decide whether or not it merits a block or a direct response from you. But don’t go on a blocking spree! If someone gives you a bad review, however, you should address it professionally instead of blocking it from the public. Learn more about dealing with bad reviews here. Social media is one of the best ways to get your original content out there. When you post a blog article to your website, share it on all of your social media sites so that your followers can check it out and then share it with their friends as well. When posting your own content, this shows your followers that you’re the authority on the subject and their go-to guru when they have questions or need to hire a professional for the job! Want to learn more about blog writing? Check this out. When working in a creative field like makeup artistry, event planning, or home decor, it’s almost impossible to log on to your social media sites without seeing a stunning eyeshadow application, an exquisite centerpiece, or a perfect kitchen design that you want to share with your followers. But you should never save an image you find on social media and pass it off as your own – that’s a no-brainer! But what a lot of people don’t know, is that you could still get into a lot of trouble for using other people’s images without their consent, even if you don’t try to claim it as yours. That’s why you should always use the share/retweet/regram functions available if you want your followers to see something you loved, unless you have received explicit permission to use the photo from it’s original owner. Using the designated sharing functions is a perfectly acceptable way to pass something on to your followers. Note: Be careful when asking someone permission to use their images. Even if they say “yes”, they themselves may very well have stolen the image from elsewhere… and you can be held liable for using stolen pictures. Remember to post things that are relevant to your brand. If you’re a makeup artist sharing blog posts about your favorite restaurants downtown, that might not be something your followers will appreciate! If you’ve branded your site as a source for makeup inspiration, then that’s what your followers are expecting from you and will most likely engage with. You can, however, post things that are in the same ball park of your particular industry, but may not be 100% on-brand. For example, if you’re an event planner, you might share a cool video of cake-decorating, or as a professional organizer, you may share an article about the best natural cleaning products for the home! One of the first things you should decide when starting your social media business pages, is what sort of voice and personality you want to project. This will ultimately depend on who your audience is. Are they more mature individuals you would appreciate a more formal tone? Or are they younger, dare I say “hip,” people who would engage more with a funny or informal tone? Regardless of the tone you decide to take on, you should be attentive to grammar and avoid using too much slang. Save the more personal things for your own social media accounts. One of the worst things you can do on your business sites is rant about something totally unrelated to your following base. This projects a negative image of yourself and your followers will question your professionalism. If you’ve decided to take on a relatable, more casual voice on your social media pages, you can definitely get away with posting more personal content, like a funny picture of your cat or a family photo at Christmas time. The selfie: While some of your followers may not appreciate a daily picture of your face, there are times when it can actually be totally appropriate. Remember to keep it relevant to your brand and industry. For example, as a makeup artist, you may want to post cool looks you’ve created on yourself or just show off your makeup for the day. Selfies can give a personal touch and allow your audience to relate to you better! But there’s a time and a place, and you don’t want to over do it. As you’re well aware, social media is a great way to connect with your potential and past clients and will help grow your business. Because it is such an important tool, you want to ensure you’re using it correctly and getting the most you possibly can out of all your efforts. Perhaps there’s a particular image size that gets more views than another, or maybe there’s a time of day when it’s best to post something. Whatever the case, you should be aware of it and use that to strategize your posts. Consider subscribing yourself to a blog, do a few Google searches once in a while to ensure you’re still on track, and read more articles about social media like this one. To learn more great tips, check out their blog and on-line courses.